The University of Toronto Faculty of Law offers a unique setting for the study of environmental law. Our faculty counts leading experts in the subject among its ranks, including the endowed Metcalf Chair in Environmental Law. The city of Toronto is a centre of environmental activity, as the home of many environmental groups and environmental law practices. Our environmental law curriculum builds upon the core areas of legal education in first year, many of which intersect with environmental law, and draws on the wide range of course offerings in the upper years to create opportunities for individualized programs of study. The September 2007 issue of Nexus, the law school's magazine, focused on the theme of "Law and the Environment." It included articles about student and alumni involvement in environmental issues. Graham Fellow Maria Banda writes "Why should trees have legal rights? 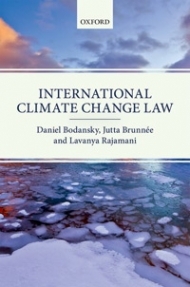 It’s second nature"
Jutta Brunnée is a specialist in international law and international environmental law with extensive publications on these issues.